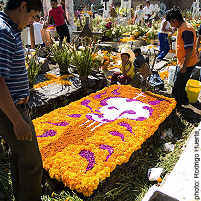 I n Mexico, Day of the Dead is one of the most colorful and charming holidays of the year. It is the time when Mexicans welcome the dead back to earth for a visit, even while mocking death itself. By the time Cortés and the conquistadores arrived in Mexico, the Aztecs and their ancestors had been celebrating Dia de los Muertos for more than 3000 years. In early August, they would spend nearly a month celebrating the natural cycle of death and rebirth and expecting the souls of those gone away to come home for a spell. The festival involved a lot of skulls. The Spanish tried to stamp out the age-old pagan ceremony, but like so many indigenous rituals that survive in modern Mexico, buried deep within the trappings of pious Catholicism, Day of the Dead refused to go away. It is still celebrated throughout Mexico on November 1st and 2nd. All Soul’s Day is seen as the time of year when the veil between life and death is at its thinnest, the best time for the souls of the departed to slip back home for a visit with the family. And the family does all it can to entice them. Ofrendas—altars dedicated to the dead—are constructed in public buildings and private homes, in San Miguel de Allende’s central Jardín, at the library and radio station, and in kitchens and living rooms all across town. They spill over with fruits and flowers—especially the bright orange marigolds called zempazuchitl— candles and copal incense and colorful sugar skulls. Papel picado, the elaborate Mexican cut paper, drapes the edges. 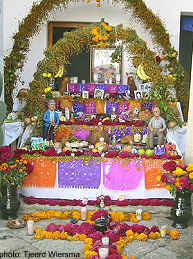 A picture of the dead person will top the altar, and favorite items, food and beverages are added. Beer is common, but tequila, mescal and even pulque are better. Who wouldn’t want to come home to a nice smooth reposado? There’s a glass of fresh water to ease the strain of breaking through the death/life barrier (thirsty work, that), and maybe a pack of cigarettes, a favorite candy, or some personal possession such as a pocketknife or keyring. And always, pan de muerto—"bread of the dead." Bakeries all over San Miguel will be working overtime to turn out sufficient quantities of this very special seasonal delicacy. Pan de muerto will be on every altar and most family tables, and it can be on yours too. You can easily make it at home with this recipe for Pan de Muerto. 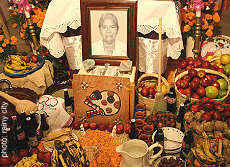 The ofrenda is both a Day of the Dead remembrance and a lure. It helps the living remember and celebrate the life of the dead, but it also tempts the souls to come home. To help the wandering dead remember the way, a path of marigold petals leads from the street into the house and up to the altar with all its goodies. On November 1st, the action moves to the cemetery. In San Miguel de Allende, the Pantheón on Ancha de San Antonio will be bustling for days beforehand with people streaming in and out with buckets and mops, rakes and hoes, fresh flowers and candles. Graves will be freshly whitewashed, weeds pulled, tombs decorated. By mid-afternoon, the crowds pour in for an all-day party and an all-night vigil. Hundreds of candles provide light, mariachis and brass bands provide the music. Picnic baskets spill dinner and snacks, bottles are passed around. Kids play then fall asleep on the ground. It might seem like a day that concentrates on death would be somber and silent. But remember, this is Mexico! 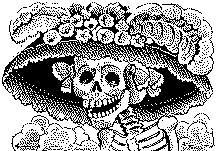 Dia de los Muertos is a warm and happy day—for remembering tender moments, smiling memories. It’s day to celebrate who and what they were. It’s also a day to mock the very idea of death. Historically, Mexico was a country where death often came early and hard. When death is easy, the best defense against the pain is to laugh in its face. 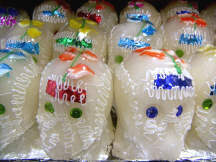 And so Mexicans invented calacas, those charming figures of skeletons in every conceivable daily situation—getting drunk in the cantina, getting married in the church, dancing at a party, playing in a park, popping up out of a coffin. These small tableaus are one of the most delightful of Mexican folk arts. In San Miguel de Allende, a special Day of the Dead market fills the plaza just down the broad stairs from Plaza Civica for the two weeks or so before the holiday. Colorful sugar skulls, carved wood skeleton puppets, miniature coffins and every type of calaca are found here. It’s a great place to stock up on holiday supplies and pick up wonderful souvenirs of a San Miguel stay. Day of the Dead in San Miguel de Allende might turn out to be the high point of your stay. It has been for me.